Senior travel has been a big part of Ontdek since 1996. We design and deliver unique walking, bird watching and wildlife safaris specifically for the active senior traveler. An outstanding feature of the elderly travelers who join our tours in Kenya is that though their days for extreme adventure are over, they are active to their ability and they certainly don’t want to spend their days confined in a safari minibus during their Kenyan vacation. Go directly to the itineraries. Why do seniors travel to Kenya with Ontdek? - Because we offer them an African safari that matches their active lifestyles - often this is found in walking that extra kilometer at their own pace while following grazing gazelles or adding a new bird species to their checklist. - Senior travelers also are particular about the areas they visit and they appreciate our preference for small national parks and private games reserves that are rich in game but are not visited by mass tourism. - We bring out the very best in the senior travel in Kenya: relaxed itineraries that have game viewing walks with ease to see game, cultural interactions, competent naturalists guides and of course big game viewing in Masai Mara. All walks are flexible so clients can choose how long they want to walk and we provide more than one naturalist guide to accommodate different walking abilities. Read more on how we organize our guided tours in Kenya. - Perfect and flawless ground logistics are the hallmarks of Ontdek's seniors travel. All tours are fully supported and accommodation is in comfortable lodges and tented camps with en suite facilities and unfailing high standards of hospitality. For total relaxation during the tour we stay in one of our selected lodges for a minimum of 2 nights, thus giving us a base away from home without the inconvenience of packing up every morning. We have also significantly cut down the long transfers by car as is common in the park-to-park safaris. Click here to know exactly what to expect or not to expect on a luxury safari in Kenya. - We are aware that good travel for senior citizen is about trust and we have over the time gained a reputation of reliability from a good portfolio of overseas tour operators, as well huge number of independent travelers who book direct with us. So you can with confidence book your African senior tour knowing that you are dealing with a genuine and professional tour operator in Kenya. We can customize a safari to suit your needs. 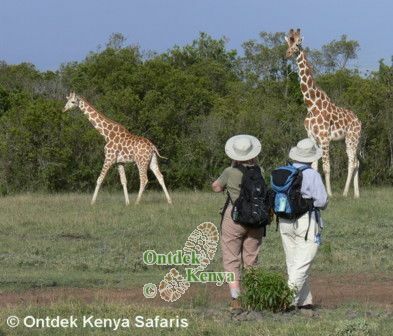 Contact Ontdek Kenya Safaris for your tailor-made senior travel to Kenya. From the samples of our seniors travel, this is a relaxed 7 days seniors hiking vacation with lots of game, reduced road transfers and good accommodation (no camping) in areas not visited by mass tourism. The dormant Menengai Crater is the starting point of this Kenya hiking adventure that shows variety of landscapes found in the Rift Valley. Lake Nakuru is colored pink with thousands of flamingos and Lake Naivasha has a huge population of hippos. Hike in the savannas in Hell’s Gate, Crater Lake and Crescent Island that are home to plains game such as baboons, giraffes, elands, zebras, various gazelles and warthogs. We handle all tour logistics leaving you free to enjoy your active seniors vacation. See detailed itinerary. With over a decade of running quality travel for seniors in Kenya, our senior walking tours are relaxed giving you enough time to explore the selected parks that you visit. You will visit our popular private game conservancies in the Rift Valley and the Swara Plains - highlight here is the huge numbers of oryx, elands and other plains game. A safari in Amboseli with the snow-capped Kilimanjaro takes 3 days giving us enough time to see huge herds of elephants, rhinos, buffaloes, cats and plains game. This is a seniors travel that is ideal for wildlife enthusiasts, bird watchers and wildlife photography. See detailed itinerary. Be away from mass tourism as you walk in Crater Lake and Crescent Island sanctuaries, Hell’s Gate National Park with guaranteed sightings of Giraffes, Waterbucks, Elands, Zebras and various Gazelles. Travel to Lake Nakuru National Park, which is colored pink with thousands of Flamingoes, and the open grasslands are home to the White Rhino and the Rothschild’s Giraffe. The Black Rhinos are found in the forests around the lake. This seniors walking vacation then moves on to Masai Mara, the Africa that every one dreams of. 3 days here will enable you to explore the plains and hills on the look out for Elephants, Lions, Leopards, Cheetahs, Topis and Hippos. A walk guided by Masai Morans makes this a perfect 50plus vacation in all senses. See detailed itinerary. On our safaris for 50plus travelers quality time is spent in the field on soft game viewing walks, bird watching or responsible wildlife viewing. We deliberately go for slow programs and for areas in a close circuit meaning that you won't spend most of your safari days on long & exhausting road transfers. On this tour we visit the one-off Sunbird Lodge, situated on an outcrop overlooking Lake Elementaita. From there we visit Lake Nakuru and the Soysambu Conservancy. We spend three days in the Lake Naivasha area with soft game viewing walks on Crescent Island, Hell's Gate and Crater Lake and finish off with Masai Mara, the Africa everyone dreams of. See detailed itinerary. The senior adventure starts with walks in the indigenous forests of the game rich Aberdare sanctuary and the Solio ranch. Have a safari in the Solio game reserve, which has the highest concentration of black rhinos in Africa. Spend a night of wildlife viewing from the balcony of your room at Treetops - a tree hotel in the Aberdares. The vacation then progresses to scenic places in the Great Rift Valley for more game and walks in Crescent Island, Crater Lake, Hell's Gate and Elementaita with guaranteed interruptions from Giraffes, Waterbucks, Elands, Zebras and various Gazelles. A wildlife safari in Masai Mara, the Africa that every one dreams of, takes the last 3 days of the tour with Elephants, Lions, Leopards, Cheetahs, Topis and Hippos all calling for our attention. 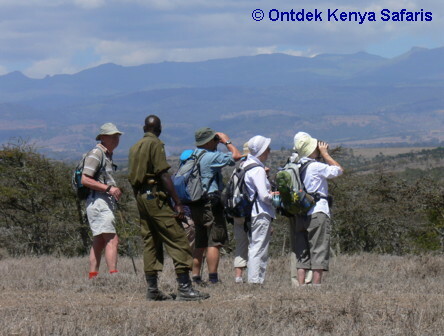 A walk guided by Masai Morans is among the many highlights in this seniors adventure. See detailed itinerary.